The answer for both questions is $0.5$ and this can be obtained without any calculations. 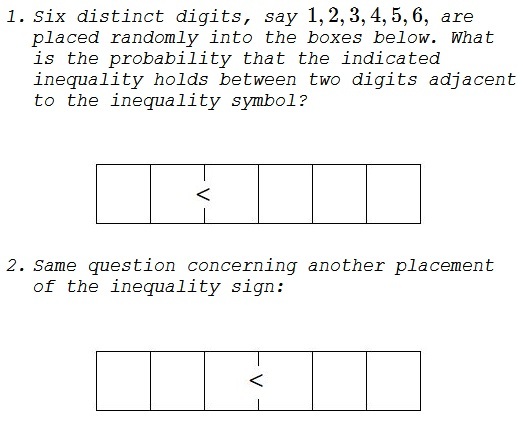 Indeed, any placement of the digits that satisfies the inequality is paired with another one that does not. The two are obtained from each other by swapping the two digits adjacent to the inequality sign. Nicu Mihalache was the first to suggest that approach on twitter. These problems have been inspired by Donald Knuth's puzzles from the multi-author collection Puzzle Box, v 2.